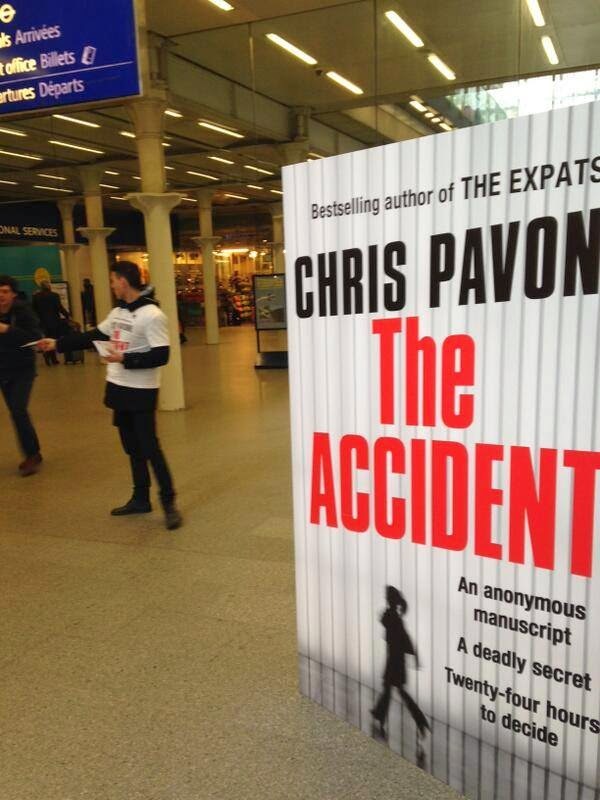 A thriller writer who is getting a great deal of attention is Chris Pavone. I first bumped into Pavone at Bouchercon Albany last autumn, where he was discussing his debut, the award-winning THE EXPATS, and tucked into our book bags was a proof copy of his follow-up THE ACCIDENT, which is a remarkable tale, and one that is a ‘one-sitting read’. As Bouchercon is always a blur of panels, events, and parties we only had a few minutes after his panel to discuss his debut THE EXPATS, so I was delighted to join my fellow literary critics to meet him in London, thanks to Faber and Faber. 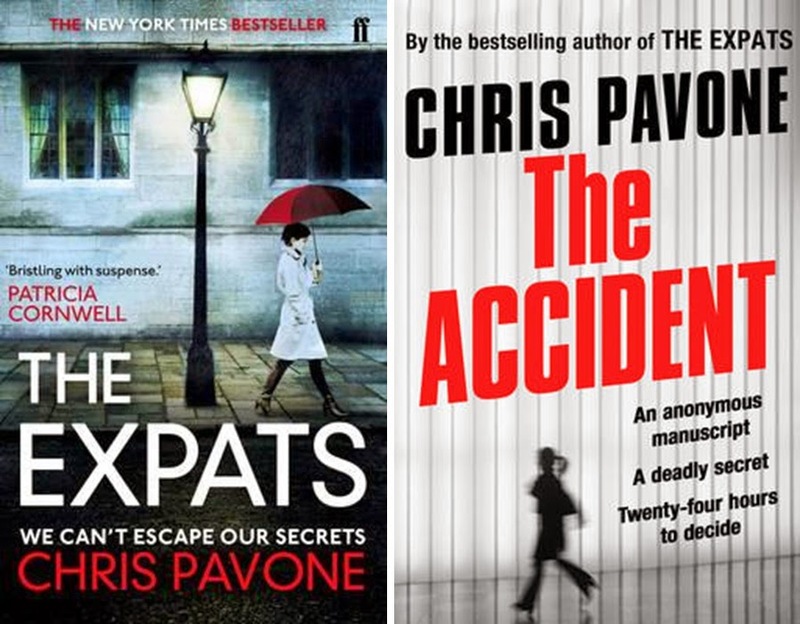 Chris Pavone managed to turn his experience in book editing and living in Luxembourg into an Edgar-winning spy novel, “The Expats.” With “The Accident,” he matches that first novel’s nail-biting level of excitement while continuing to write about what he knows. “The Accident” is a thriller about publishing, and if that sounds like an oxymoron, Mr. Pavone is very good at rendering it wildly dramatic. He’s also good at diverting close scrutiny about where any holes in his story may be. He just keeps the shocks coming and leaves the head scratching for later. Just take it for granted that “The Accident” is about a manuscript so earth-shattering that people in the publishing world would kill to get their hands on it. Mr. Pavone’s first deft move is to steer the red-hot manuscript, a biography, toward Isabel Reed, the glamorous New York literary agent who is the natural choice for dealing with a book of potentially nuclear impact. Isabel is renowned for her discretion. She knows how delicately the book needs to be handled. Mr. Pavone (pronounced puh-VOH-nee), who is 45, is not the typical suspense writer who speedily produces a book or two each year. But he does bring an unusual résumé to the task of making the publishing industry seem thrilling: He spent decades working as an editor, primarily at Clarkson Potter, an illustrated-book publisher, where he worked on nonfiction titles about interior design, dogs, cocktails and food, among other things. His first novel, “The Expats,” was published in 2012 and sold nearly 200,000 copies, winning critical raves and an Edgar Award. He is also half of a formidable publishing power couple. His wife, Madeline McIntosh, is the president and chief operating officer at Penguin Random House and one of the industry’s most influential executives, often mentioned as a potential successor someday to Markus Dohle, the company’s chief executive. It was Ms. McIntosh’s ascending career that indirectly led Mr. Pavone to start writing fiction in the first place. In 2008, she took a high-level job at Amazon that required the couple and their twin sons, 4 years old at the time, to move to Luxembourg, where Amazon has corporate offices. So with a solid publishing background, Pavone’s work was picked up by Angus Cargill of Faber and Faber for release in the UK and Ireland. 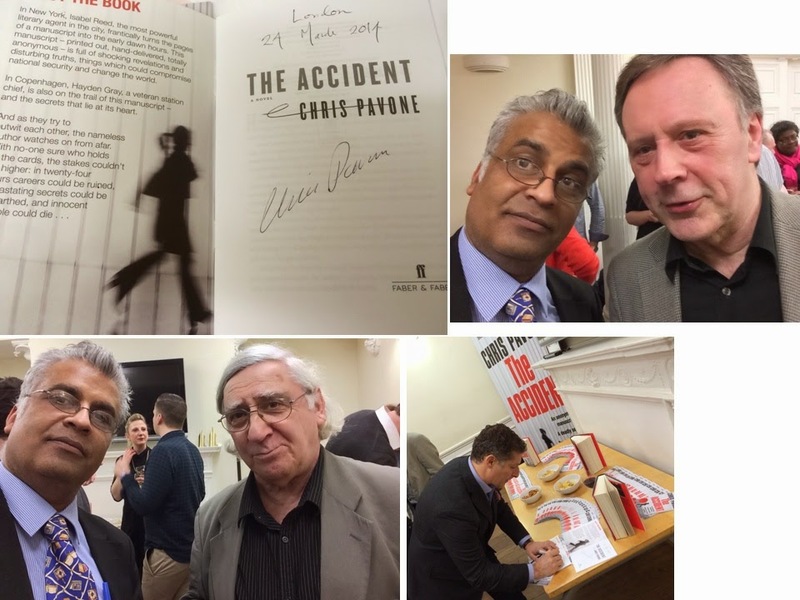 To celebrate the launch of THE ACCIDENT, Faber and Faber invited a selection of London Literary Critics to meet Chris and discuss this startling novel over wine and canapés. The Shots team of Ayo Onatade and Mike Stotter were joined by Delores and Maxim Jakubowski, Lizzie Hayes, Barry Forshaw, Jake Kerridge of The Telegraph and many others. Faber and Faber have organised a competition to win 3 signed copies of a sample chapter of THE ACCIDENT for Shots Readers. All you have to do is email your name to shotscomp@yahoo.co.uk with CHRIS PAVONE in the subject line, with a return Postal Address [UK and Ireland only we’re afraid as geographical restrictions apply] – three random emails will be selected as winners. All correct entries will be entered into a prize draw and the first three correct answer picked at random on 14/4/14 will be declared the winners. In New York City, Isabel Reed, one of the most respected and powerful literary agents in the city, frantically turns the pages of a manuscript into the early dawn hours. This manuscript - printed out, hand-delivered, totally anonymous - is full of shocking revelations and disturbing truths, things which could compromise national security. Is this what she's been waiting for her entire career: a book that will help her move on from a painful past, a book that could save her beloved industry... a book that will change the world? In Copenhagen, Hayden Gray, a veteran station chief, wary of the CIA's obsession with the Middle East, has been steadfastly monitoring the dangers that abound in Europe. Even if his bosses aren't paying attention, he's determined to stay vigilant. And he's also on the trail of this manuscript - and the secrets that lie at its heart. For him, quite simply, it must never see the light of day. As Isabel and Hayden try to outwit each other, the nameless author watches on from afar. With no-one quite sure who holds all the cards, the stakes couldn't be higher: in just twenty-four hours careers could be ruined, devastating secrets could be unearthed, and innocent people could die. Gripping, sophisticated, and impossible to put down, The Accident is a masterful follow-up to one of the most acclaimed and striking debut thrillers of recent years. As Kate begins to dig, to uncover the secrets of those around her, she finds herself buried in layers of deceit so thick they threaten her family, her marriage - and her life. Thanks Ali. Great to see Chris Pavone getting more coverage. I too was taken with him at Bouchercon Albany and the ARC of The Accident made for excellent reading after the conference. Can't wait to review book 3 for my blog.